I love Rogue Casona. The kitchen has 12 foot tall windows that open onto the balcony. It’s my ideal work environment, flooded with light all day long, and it was actually these windows that convinced me to rent this place rather than a cheaper one. I don’t regret it. 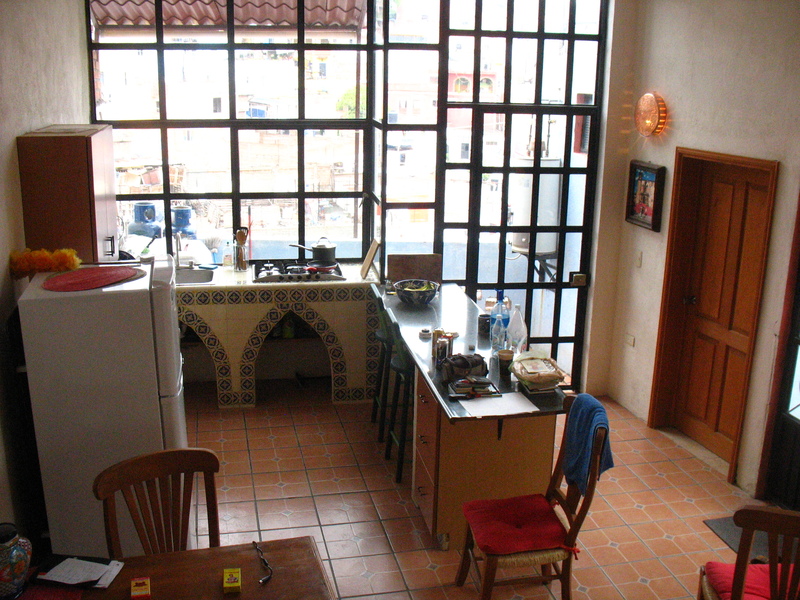 Kitchen of the Rogue Casona. I’m still a little stunned: the Casona is without a doubt the nicest place I’ve ever lived on my own. I mean, I’ve lived in nice places before but always with a roommate or girlfriend. And it’s been a long, slow climb to a successful freelance career; for much of the last three years I either lived in starving artist conditions or scrimped and hustled, or both. Waking up in these surroundings each morning is a tangible reminder that I’ve started to succeed. In the morning I practice yoga. Then I have granola, yogurt and coffee while I read. In the afternoon I focus on client work (Monday-Wednesday) and my own writing or projects (other days). In the late afternoon I wander the city and explore. Also, there are no street signs. Notice how some streets are shaded and don’t form normal intersections? Those are underground tunnels. The city is basically a canyon, and the tunnels were dug as subterranean canals to prevent flooding. Dams have since stopped the flooding problem, so now the tunnels are used for driving. Seriously. Many of the surface streets are pedestrian only. 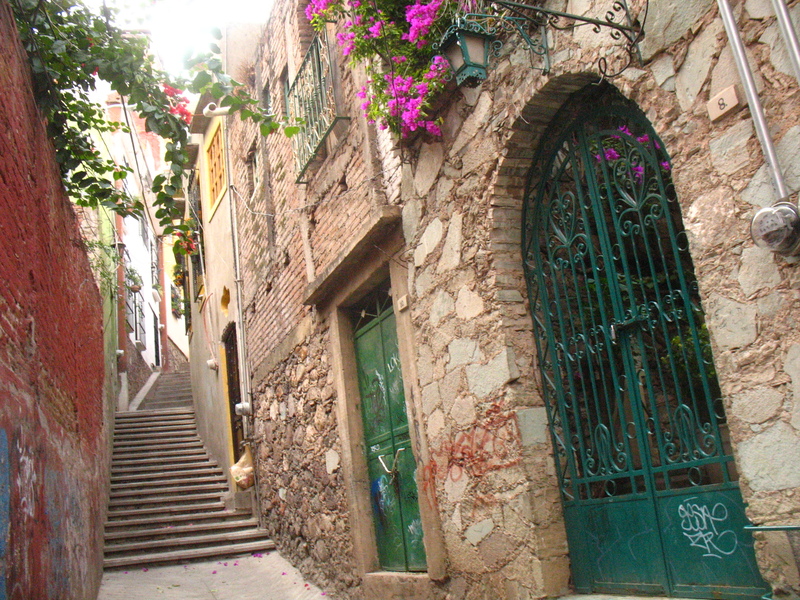 Guananajuato (GTO) has more plazuelas (little hidden squares) than plazas, and more callejones (narrow winding alleys) than streets. The alley I live on is Transversal de la Concha, which apparently is the parakeet raising district. Actually, for all I know, maybe everyone in GTO just raises parakeets. All I can say is that every house on my alley seems to have five cages’ worth. They hang the cages out of windows during the daytime, high above the callejon, so the birds get fresh air and the neighborhood fills with chirping. Be careful where you step. The owner of my building told me that the flat is “about 150 steps” up the callejon from the main street below (I count 76). He assured me “it’s not bad if you take it slow,” which is probably true, but I don’t walk slowly. I’m usually winded a third of the way up, and I’m not the only one. Whenever you see someone coming up the stairs to our neighborhood they’re sweating and panting. The person coming up and the person going down just grin at each other and laugh. Thanks to the tangled mess of alleys there are actually two staircases I can take: the “easy if you take it slow” one and a shorter, but much steeper one. I like to mix it up. But the location is pretty much perfect for someone like me. It’s what I would describe as a Mexican middle class neighborhood. A Canadian friend I met asked me, “Yeah, but it’s kind of hood over there, isn’t it?” I didn’t understand. My neighbors consist mostly of sweet older ladies carrying shopping bags or trailing niños. It seems safe and friendly. The callejon leading to my flat. The bottom of the callejon lets out on a main drag into the centro. I’m about a 10 minute walk from both the public market and a giant supermarket. I prefer the public market but the super gives me options for less common items like unsweetened granola. About five more minutes of walking gets me into the central historic district, home of GTO’s two famous theaters, one famous university, numerous plazuelas and cafes, and the Kissing Alley, which I’ll leave up to your imagination for now. Walking around this city is a challenge on many levels. For starters, I find myself deeply appreciative of my sense of navigation. It’s not that I never get lost, but I can sense whether that second right-hand turn has me headed back toward the main street, or running parallel to it. I can usually retrace my steps (either to get home, or to go back to a spot I discovered by chance). This is a skill you can learn and practice like any other. The real challenge is the terrain. You’re walking on very narrow sidewalks with uneven cobbles and there are people going both ways. Even if you’re all going the same way not everyone goes at the same speed (fast walker, remember?) so you constantly dive around each other in the politest way possible. It’s normal to step out into traffic to go around sidewalk crowds. The other night I met up with some new friends who are local to Guanajuato. It’s nice to have friends so I reached out on Couchsurfing. Sure enough, a local student named Sergio invited me out for drinks and dancing. I really need to improve my dancing skills. I’m fair-to-good by US standards, which amount to “if a guy is actually willing to dance, he is the best dancer in the room.” I’m terrible by Latin America standards and want to take lessons. Women are enthusiastic capable dancers here and deserve a good partner. The hardest part of my first week was finding good food. Don’t get me wrong, Guanajuato has great food, but as a newcomer you’re kind of just sampling places at random. I had a lot of hope when I found Plaza de San Fernando, a long sloping plaza lined on one side with affordable open-air restaurants. 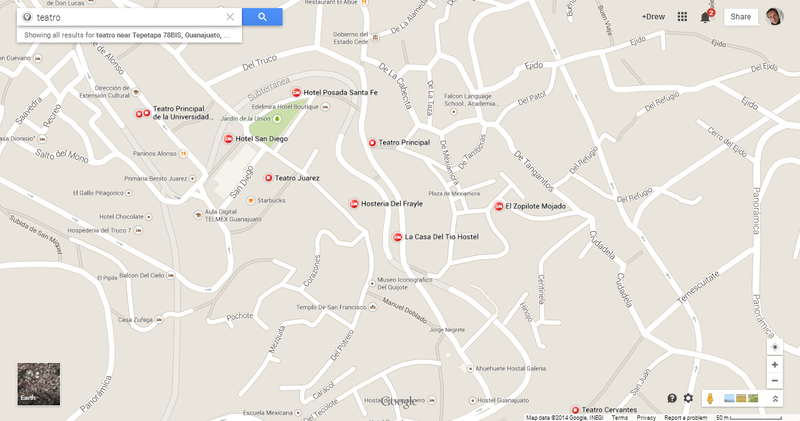 (Interestingly, Google Maps mislocates this plaza, and all the plazuelas around it, by about 1 street each.) But after sampling three of them, I can vouch that they’re really just capitalizing on their great location. The food is mediocre at best. The real tragedy for me was not knowing a good taco place. I love street food and little taquerías, but most of the ones I spotted my first week didn’t pass my skeev test. I had a few good meals at the public market, but there’s only so many times you want to walk 15 minutes for the outdoor equivalent of a food court. Then I found it: Taquería “El Pato” which means Taco Stand “The Duck.” Only five minutes from my house, I’d passed by its wood-shuttered doors numerous times without knowing it. They don’t serve duck tacos, but they do have two giant murals of Donald Duck dressed as Pancho Villa, plus one mural of that starfish guy from SpongeBob SquarePants, who is not a duck but they’re both maritime creatures so I guess they’re all buds. 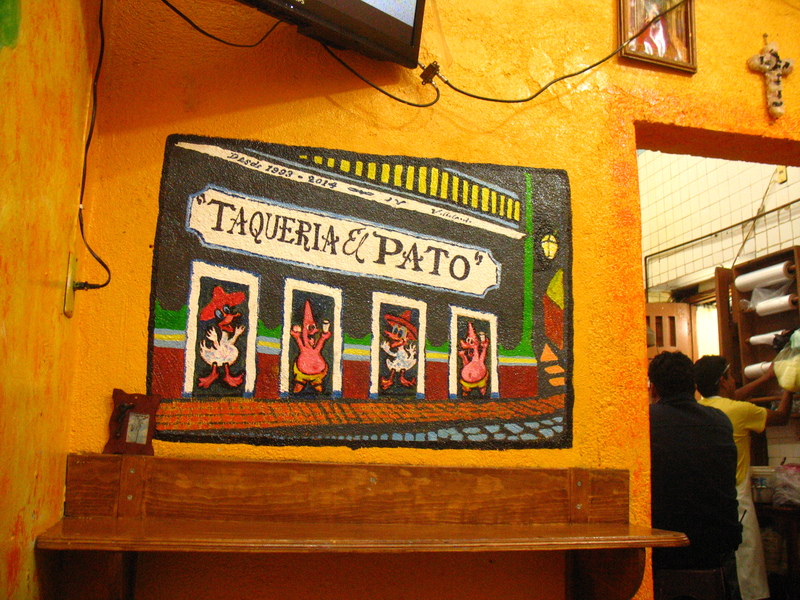 A different mural at El Pato. 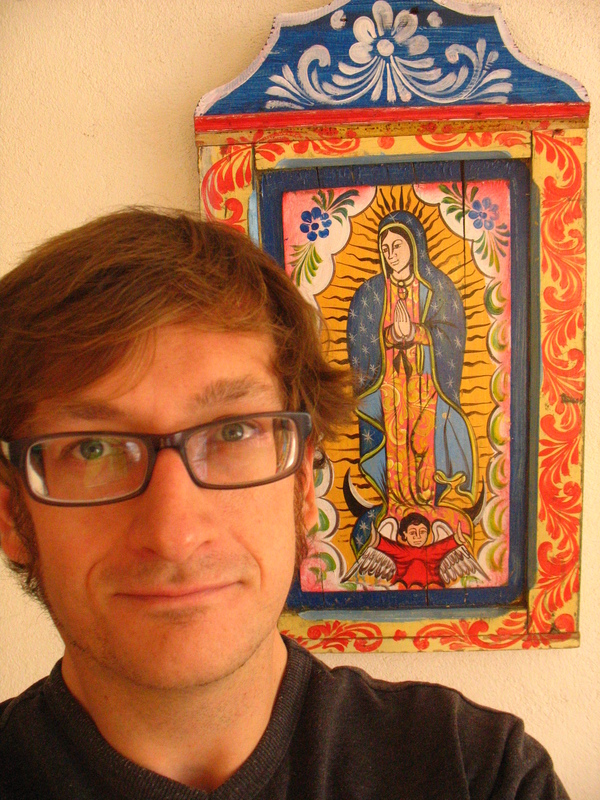 El Pato represents the end of a years-long quest: the perfect pastor. Al pastor, a form of marinaded spit-roasted meat, is my favorite filling for tacos, sandwiches, and my tummy in general. It also varies widely in quality. El Pato has the greatest al pastor I’ve ever tasted in or out of Mexico; if someone can do better I volunteer to judge the cook-off. The Pateros also make amazing tortas with crusty bread reminiscent of a baguette, and serve up a free glass of agua fresca (house made fruit drink) with every order. Amazingly, at The Duck they don’t sweeten it; if you’ve traveled in Mexico you know how rare this is. I was floored the first time I tried it (guayaba flavor—I’m a sucker for guayaba). The server gloated. “Es natural,” he said. I’m grateful I get to live here in Guanajuato. I can put up with a few hundred desecrated mummies and the long jog up the callejon stairs. I don’t know exactly what’s happening when I leave here after June, but I know I have an adventure waiting for me and I wonder often what the next leg will be like. → How Are Authentic Mexican Tacos Different from American Tacos? I love that you’re illustrating these posts! The new town sounds like a great stop; your description made me really wish I could visit it. Btw, are you doing anything to connect with NGO/ environmental/ human rights type groups along the way? A little volunteer work might go a long way towards making connections on the long trip, or lead to more real work for you. That’s a really good suggestion Kira. I was thinking of reaching out to Peace Corps volunteers once I reach Central America, but I hadn’t thought of talking to NGOs in Mexico. I’ll take a look at what orgs are working in the Gulf Coast/Yucatan area. Beautiful; it sounds like a dream. :) I’d visit the mummies – not gonna lie. Also, you are making me doubt my long standing aversion to tacos and think that perhaps I should try them again. I mostly cook at home (because I am a penny pincher), but my hometown has filled up with so many taquerias that I feel the whole population – both American and Hispanic – must dine 60% of the time exclusively on tacos. I have a hard time believing my city has enough taco eaters to support THAT MANY taquerias. I never quite “got” tacos; I always thought of them as a sandwich, with a slightly different composition but oftentimes more fat. But if you love them, and if my city has gone taqueria bonkers, maybe I should give them another chance. But yeah, I think tacos have a bad rap to a lot of Americans for a few reasons. Mostly because of how “Americanized” tacos are made (in my opinion). Mexican tacos usually have soft, fresh corn tortillas (which are healthier), an amazing variety of meats (not hamburger) and almost never have cheese or cream (a major source of the fats you mentioned). The also don’t need to be “greasy,” which is what a lot of my white friends seem to think all Mexican food is. A Mexican taco usually has different toppings, too: chopped onion, chopped cilantro, and a lineup of sauces (salsas) you can pick and choose from. Additionally, there should be piles of lime wedges you can squeeze over your taco, which I highly recommend. As you can imagine, chopped grilled steak with onions, herbs, and a spritz of lime juice is a very different flavor than a sloppy joe casserole on a flat wheat disc. If you speak no Spanish you may have a hard time being served this, because the staff assume you want the cheesy thing with tomatoes that German moms make for their kids birthday parties. You can try asking for “chivatacos” or “tacos mexicanos” but you might just have to explain/beg. I could talk about tacos all day. But instead I think I’ll go eat some. This post makes me happy. It sounds fabulous. Though good Lord I works get hopelessly lost in like 4 minutes! … And it works be totally worth it. :-) Please visit the mummies for me! Also, what exactly is a callejon? Is it like a side walk off the street? Is it standard for them to be step inclines, or is that just a fluke of your location? The more I think about this, the more I think this city is going on my vacation spots list! You should totally visit it. You’d really enjoy it. A more local word is callejoneada, a “callejon party.” Musicians and revelers go from alley entrance to alley entrance serenading the neighborhood, inviting the residents of that alley to join them and drinking. Ok, so I realized the folly of “American and Hispanic” after I typed it, but I figured you knew what I meant so I left it. I auto-switch Mexican for Hispanic because, as a white girl in the south, apparently people get offended if I refer to them as Mexican (even if they came from Mexico, because we’re all American now, which is understandable). I edit out “Mexican” to avoid that… in this case it was accidental and inappropriate. So yep… I scolded myself for that already. Heh, no worries, I knew it was just an innocent slip.